Bariatric surgery is often a recommended solution when diet and exercise haven't succeeded or when the patient suffers from serious health problems related to his or her weight. There are various types of weight-loss surgery, collectively known as bariatric surgery. Bariatric surgery is often a recommended solution when diet and exercise haven’t succeeded or when the patient suffers from serious health problems related to his or her weight. Bariatric surgery involves making changes to the digestive system, resulting in weight loss by limiting how much can be eaten, by reducing the absorption of nutrients, or both. There is no one-size-fits-all bariatric surgical procedure. A number of factors are involved such as how much weight you need to lose, the type of health problems involved, and each procedure’s risk level and cost. Bariatric surgery specialists at Advanced Surgical Solutions will help you determine which procedure is the best fit for you. Most bariatric procedures can be performed laparoscopically, which is generally a better option since it results in shorter hospital stays, lower infection rates and smaller scars. However, open surgery may be necessary in certain situations, such as if the patient has a buildup of scar tissue from previous surgeries. To ensure the long-term success of bariatric surgery, patients must make permanent lifestyle changes such as a healthy diet and regular exercise. Our experienced nutritionists will educate you and provide the guidance you need to improve your eating habits, which is necessary for a positive outcome. Making the decision to undergo bariatric surgery requires careful consideration, which includes comparing the benefits to the possible risks – as well as the risk involved in not having the surgery. If you have tried to lose weight through diet and exercise without success and are considering weight-loss surgery, we encourage you to become informed about obesity and available treatment options. When you are ready to take the next step and consult with one of our bariatric surgical specialists, call us at Advanced Surgical Solutions to schedule an appointment. With LAP-BAND surgery, the surgeon wraps a silicone and Silastic band around the top part of the stomach and sews it in place. This divides the stomach into a small upper pouch and a lower stomach. Because the upper pouch can hold only about four ounces of food, the patient will eat less, feel full sooner and feel satisfied longer. Since the intestines are not re-routed, nutrients from food will continue to be absorbed. There is a relatively low rate of serious complications with lap band surgery, but it carries a higher percentage of minor complications and revisions. Sleeve gastrectomy has been growing in popularity with many top bariatric surgeons, and may even be surpassing gastric bypass as the bariatric surgery standard. With this procedure, the surgeon removes a large portion of the stomach, leaving a banana-shaped “sleeve” that connects the esophagus to the small intestines. Unlike gastric bypass, sleeve gastrectomy does not rearrange the digestive system. The stomach is made smaller – causing the patient to eat less – but its functionality does not change. Another benefit is reduced hunger, because a hormone responsible for appetite is located in the larger part of the stomach that is removed during the surgery. Sleeve gastrectomy carries a lower complication rate, fewer malabsorption problems and a quicker recovery. Laparoscopic gastric bypass surgery is the most common type of bariatric surgery. It has a slightly higher risk than less invasive procedures, such as lap band surgery, but it delivers consistently positive results. With this procedure, the stomach is divided into a small upper section (called the pouch) and a larger bottom section. This causes the patient to eat less. 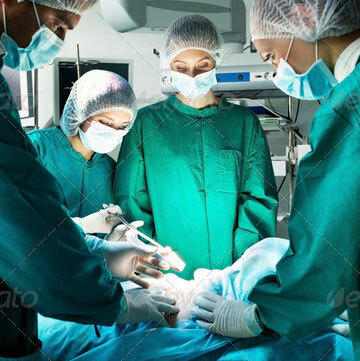 The surgeon also bypasses the lower part of the stomach by connecting part of the small intestine to a small hole in the pouch. Food will travel from the pouch into the small intestine, and the body will absorb fewer calories. Occasionally, patients who have undergone gastric bypass or lap band surgery will require a revision because of unsatisfactory weight loss or device related issues. In addition, patients who had certain bariatric surgeries that are no longer being performed often experience complications that necessitate a revisional surgery. Most revisional bariatric surgeries are successful when performed by an experienced surgeon. If you are dealing with complications from a previous bariatric surgery, call Advanced Surgical Solutions to schedule an appointment with a skilled bariatric surgeon who can assess your particular issue and recommend a treatment solution.